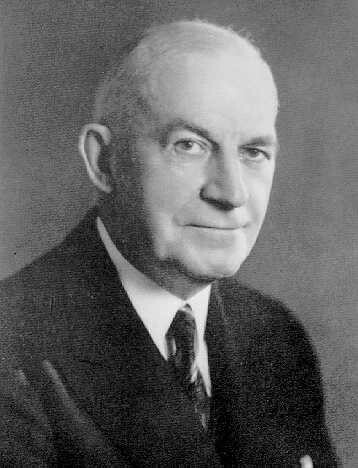 Edward Scribner Ames was born in Eau Claire, Wisconsin on 21 April 1870. His father was a Disciples of Christ minister for a series of Midwestern towns. He received his B.A. and M.A. from Drake University in Des Moines, Iowa, and then attended Yale University Divinity School. He received the Yale B.D. in 1892 and continued to study philosophy there for two more years. Transferring to the University of Chicago for a fellowship during 1894-1895, he earned a Ph.D. in philosophy in 1895, awarded by professors John Dewey and James Tufts. Ames first taught at Butler College, Indianapolis, for three years but soon returned to accept a philosophy position at Chicago in 1900, which he held until his retirement in 1936. Ames died in Chicago on 29 June 1958 and his ashes were spread behind the family cottage on Lake Michigan in Pentwater, Michigan. Ames's special interest was the psychology and sociology of religion. He published several influential studies of religious experience and values, along with doctrinal studies relating to the Disciples of Christ. Strongly influenced by his colleagues, he quickly joined their Chicago School of Pragmatism and advanced a pragmatic understanding of God and doctrine, similar in many respects to Dewey's religious humanism. Like his colleagues in philosophy and other Chicago departments, Ames was active in the life of his city, joining the City Club and serving on reform committees. Ames maintained his devotion to the Disciples of Christ and was in close association with other leading figures of the movement. He was one of the founding members, with other graduates of Yale and Chicago, of the Campbell Institute in Chicago in 1896. Ames edited The Scroll, the quarterly organ of the Campbell Institute, from 1925 to 1951. He was the minister of the Hyde Park Christian Church (renamed the University Church of Disciples of Christ) in Chicago from 1900 to 1940. He also served as the Dean of the Disciples Divinity House in Chicago from 1927 to 1945. Ames's distinctively liberal and humanistic approach to both theology and ministerial leadership brought him into repeated conflicts with more conservative elements of the denomination. Among the specific doctrinal questions for which Ames is remembered is the humanity of Jesus, the denial of an afterlife, the diminished role of baptism, and open membership. Church historians over the years have taken notice of his activities. An early example of this attention is Errett Gates, The Disciples of Christ (1905), pp. 319-320. "Another Butler College professor fell under criticism in 1898, in the person of E. S. Ames, professor of philosophy, on account of certain utterances made in an article in the New Christian Quarterly. He became pastor of the Hyde Park Church, Chicago, in 1900, and shortly after published a sermon entitled, A Personal Confession of Faith. No notice was taken of the sermon until two years after its publication, when, in connection with a sermon advocating "Associate Church Membership," he was denounced by the editors of the Standard as a Unitarian and apostate from the accepted teachings of the Disciples, and pronounced unworthy of fellowship among them. The church of which he was pastor was called upon to dismiss him or acknowledge its agreement with his opinions. The church took action in a series of resolutions declaring its loyalty to the doctrinal position of the denomination, and affirming its right to liberty in local church government, as well as in doctrinal matters not involving the essential teachings of Christianity." Here is another view of Ames's church, from Nathaniel S. Haynes, History of the Disciples in Illinois 1819-1914, p. 160. Hyde Park Church of Disciples of Christ (Fifty-seventh Street and Lexington Avenue). Organized 1894, by H. L. Willett; present membership, 200; value of property, $7,000; Bible school began 1894; present enrollment, 100. Prof. W. D. MacClintock was also active in the formation of this church. Meetings were first held in the Masonic Hall on Fifty-seventh Street, east of Washington Avenue, and later in Rosalie Hall. Mr. Errett Gates succeeded Mr. Willett in the pastorate, and during this period the present chapel was built on the lots owned by the Disciples' Divinity House. E. S. Ames has served as pastor since 1900. In this congregation "one of the most important features has been the adoption of a plan by which Christian union could be practically and effectively realized. This plan does not assume to change the terms of church membership as taught and practiced by the great body of Disciples. It simply recognizes members of the congregation' as well as of the church in the technical sense. This plan has been employed since 1903 with the happiest results. It has not caused the slightest friction here." The church includes forceful people, and is active in many philanthropic and charitable agencies of the city. For a time it supported Mr. and Mrs. Guy Sarvis as missionaries in China. The congregation continues its $600 yearly to the Foreign Society. Ames enjoyed the complete confidence of his Chicago congregation during his tenure, encouraging a thoroughly pragmatic approach to church life and activities. Unlike Dewey, whose religious views matured after he left church membership, Ames refined his pragmatic religion in actual church practice and leadership. The Psychology of Religious Experience. Boston and New York: Houghton Mifflin, 1910. The Divinity of Christ. Chicago: New Christian Century Co., 1911. The Higher Individualism. Boston and New York: Houghton Mifflin, 1915. The New Orthodoxy. Chicago: University of Chicago Press, 1918. Religion. New York: Henry Holt and Co., 1929.
Letters to God and the Devil. New York and London: Harper and Brothers, 1933. A Comparative Analysis of Two Contemporary Philosophers of Religion, Edward Scribner Ames and Arthur Campbell Garnett, by Henry Toogood. S.T.M. Thesis, Oberlin College, 1949. Arnold, Charles Harvey. Near the Edge of Battle: A Short History of the Divinity School and the Chicago School of Theology, 1866-1966. Chicago: Divinity School Association, University of Chicago, 1966. Arnold, Charles Harvey. "A School That Walks the Earth: Edward Scribner Ames and the Chicago School of Theology." Encounter 30 (Fall 1969): 314-339. Arnold, Charles Harvey. God Before You and Behind You: The Hyde Park Union Church Through a Century, 1874-1974. Chicago: The Hyde Park Union Church, 1974. "Edward Scribner Ames." With an Introduction by W. Clark Gilpin and selected writings by Ames. In The Chicago School of Theology--Pioneers in Religious Inquiry, vol. 1: The Early Chicago School, 1906-1959, eds. W. Creighton Peden and Jerome A. Stone (Lewiston, N.Y.: Mellen Press, 1996). Edward Scribner Ames Papers at the Morris Library Special Collections, Southern Illinois University, Carbondale. Edward Scribner Ames Papers at the Disciples of Christ Historical Society, Nashville, Tennessee. Edward Scribner Ames Papers at Special Collections, University of Chicago Library. From Faith of the Free, ed. Winfred E. Garrison (Chicago: Willett, Clark, 1940), pp. 263-276, with additions and corrections by John Shook. The Psychology of Religious Experience. Boston: Houghton Mifflin Co., 1910. 427 pp. Reprinted, New York: Red Label Reprints, 1931. The Divinity of Christ. Chicago: New Christian Century Co., 1911. 123 pp. The Higher Individualism. Boston: Houghton Mifflin Co., 1915. 161 pp. The Psychology of Religion: A Professional Reading Course. The American Institute of Sacred Literature. Chicago: University of Chicago Press, 1917. The New Orthodoxy. Chicago: University of Chicago Press, 1918. 127 pp. 2nd edition, Chicago: University of Chicago Press, 1925. Religion. New York: Henry Holt and Co., 1929. 324 pp. Reprinted, New York: Red Label Reprints, 1931.
Letters to God and the Devil. New York: Harper and Brothers, 1933. 113 pp. Beyond Theology: The Autobiography of Edward Scribner Ames. Edited by Van Meter Ames. Chicago: University of Chicago Press, 1959. Prayers and Meditations of Edward Scribner Ames. Edited by Van Meter Ames. Chicago: Disciples Divinity House of the University of Chicago, 1970. The Value of Theology, pp. 17-51 in Our First Congress. J. H. Garrison, editor. St. Louis: Christian Publishing Co., 1899. Prayer, in University of Chicago Sermons. T. G. Soares, editor. Chicago: University of Chicago Press, 1915. History of the Campbell Institute, pp. 33-43 in Progress: Twentieth Anniversary Volume. Chicago: Christian Century Press, 1917. Moral Education of the Training School Inmate, pp. 25-29 in National Conference for Social Work: Proceedindgs, 1919. In the Twentieth Century, pp. 11-13 in 1894-191: Twenty-fifth Anniversary. Hyde Park Church of Christ. Chicago, 1919. Religion of the New Age, pp. 10-13 in America and the New Era: A Symposium on Social Reconstruction. E. M. Friedman, editor. New York: E. P. Dutton & Co., 1920. The Mystics: Their Experience and Their Doctrine, in Proceedings of the Sixth International Congress of Philosophy, 1926. My Idea of God, pp. 235-50 in My Idea of God, A Symposium. J. F. Newton, editor. Boston: Little, Brown & Co., 1926. The Far Horizon: Sermon in King's Chapel, Boston, in Best Sermons. J. F. Newton, editor. New York: Harcourt, Brace & Co., 1927. Religious Values and Philosophical Criticism, pp. 23-35 in Essays in Honor of John Dewey on the Occasion of His Seventieth Birthday, October 20, 1929. New York: Henry Holt & Co., 1929. Social Idealism in Its Relation to the Emotional Life of the Child, pp. 225-65 in The Child's Emotions. Chicago Association for Child Study and Parent Education. Chicago: University of Chicago Press, 1930. Theory in Practice, pp. 1-29 in Contemporary American Theology (Autobiographies). Second series. V. T. A. Ferm, editor. New York: Round Table Press, 1933. Christianity and Modern Scientific Thinking, pp. 25-33 in Modern Trends in World Religions. A. E. Haydon, editor. Chicago: University of Chicago Press, 1934. Religious Ceremonials and Their Symbolism, pp. 80-106 in The Church at Work in the Modern World. W. C. Bower, editor. Chicago: University of Chicago Press, 1935. Reprinted, New York: Librarian Press, 1967. Radical Protestantism, pp. 63-75 in Varieties of American Religion. C. S. Braden, editor. Chicago: Willett, Clark & Co., 1936. The Present Outlook in Philosophy of Religion: From the Standpoint of a Naturalist, pp. 332-37 in American Philosophies of Religion. H. N. Wieman and B. E. Meland, editors. Chicago: Willett, Clark 7 Co., 1936. Several contributions, passim, in In That Case . . . Murray H. Leiffer, editor. Chicago: Willett, Clark & Co., 1938. Theology from the Standpoint of Functional Psychology. American Journal of Theology, 10:219-32. April 1906. Non-Religious Persons. American Journal of Theology, 13:541-54. 1909. Religion and the Psychical Life. International Journal of Ethics, 20:48-62. 1909. Psychological Basis of Religion. Monist, 20:242-62. 1910. Social Consciousness and Its Object, Psychological Bulletin, 8:407-16. 1911. The Survival of Asceticism in Education. American Physical Education Review,19:10-18. 1914. Mystic Knowledge. American Journal of Theology, 19:250-67. 1914. Psychology of Religion. Biblical World, 49:124-27; 189-93; 252-59; 317-22; 380-86. 50:52-57. 1917. Beyond Protestantism. Open Court, 33:397-405. 1919. Religious Values and the Practical Absolute. Presidential Address of the American Philosophical Association, 1921. International Journal of Ethics, 32:347-65. 1921. Religion in Terms of Social Consciousness. Journal of Religion, 2:264-70. 1921. The Validity of the Idea of God. Journal of Religion, 2:462-81. 1921. Original Human Nature. Journal of Religious Education, 18:8-10. 1923. Character Through a Cause: a Baccalaureate Sermon. Rice Institute Pamphlets, 11:181-95. 1924. Religion of Immanuel Kant. Journal of Religion, 5:172-77. 1924. Monist, 35:251-47. 1925. Definition of Religion. Journal of Religion, 7:294-300. 1927. Religion and Philosophy. Journal of Religion, 8:14-29. 1928. Religion and Morality. International Journal of Ethics, 38:295-306. 1928. Religion and Art. Journal of Religion, 8:371-83. 1928. A Thanksgiving Sermon -- 1928. University of Chicago Chapel. Religious Education, 23:1039-45. 1928. Can Religion Be Taught? Religious Education, 25:42-50. 1930. Our Machine Age. Religious Education, 26:600-6. 1931. Humanism. Paper before the Chicago Literary Club. Club Papers, 1931. pp. 5-33. Christianity and Scientific Thinking. Journal of Religion, 14:4-12. 1934. A Philosophy of Life. Convocation Address at the University of Chicago, 1934. University of Chicago Magazine, 1934. Liberalism in Religion. International Journal of Ethics, 46:429-43. 1936. What a Ph.D. Thinks About: Address at the 1936 Convocation Dinner of University of Chicago Doctors of Philosophy. University of Chicago Magazine, 1936. Christian Union in the Local Congregation. July 7, 1910. The Message of Tagore. March 12, 1914. Mysticism Not the Essence of Religion. May 14, 1914. Disciples Hymnbooks and Trinitarianism. Sept. 24, 1914. Practicing Christian Union. Jan. 13, 1916. The Use of Hymns: How the Hymnbooks Are Rewritten. Nov. 2, 1916. A Letter to A. McLean. April 26, 1917. A Letter to the Church. Aug. 16, 1917. A Letter to a Business Man. Jan. 10, 1918. For These Times of War: a Prayer. Oct. 10, 1918. A Letter to the Mother of an American Soldier. Oct. 24, 1918. Ernst Haeckel and the Passing of Naturalism. Sept. 18, 1919. Beyond Protestantism. Oct. 23, 1919. A Letter to Abraham Lincoln. Feb. 12, 1920. A Letter to God. Oct. 14, 1920. Unsectarian Membership in the Local Congregation. Sept. 22, 1921. Our Philosophers and the Mind of Jesus. Feb. 16, 1922. Modern Morals and Christian Ideals. April 20, 1922. A Letter to the Devil. June 1, 1922. A Letter to Alexander Campbell. Oct. 5, 1922. What Is Religion? May 17, 1923. A Vital Church. Feb. 18, 1926. What Salvation Can the Church Offer Today? Feb. 23, 1928. What is Religion For? Christian Century Pulpit, Feb. 1930. What Is Religion? May 17, 1932. Three Great Words of Religion. Dec. 13, 1933. Liberalism Confirmed. In the series "How My Mind Has Changed." March 22, 1939. A Pastoral Prayer. Christian Century Pulpit, Jan. 1940. A Forty-Year Pastorate. Oct. 2, 1940. The Quest of a Name. New Christian Quarterly, 4:17-25. Oct. 1895. A New Epoch in the History of the Disciples. Christian Quarterly, 4:17-25. Oct. 1895. The Hyde Park Church of Christ. Christian Standard. 37:370. March 23, 1901. Questions Concerning Personal Religious Experience. Christian-Evangelist, 42:1457. Nov. 9, 1905. A Personal Religious Experience. Christian-Evangelist, 43:205, 211. Feb. 15, 1906. The Menace of Our Missionary Societies. Christian Standard. 47:1540. Sept. 23, 1911. Mr. Briney's Contention. Christian Standard, 47:1748-49. Oct. 28, 1911. Mr. Briney Again. Christian Standard, 47:1941. Nov. 25, 1911. 53: 232. Feb. 24, 1917. The New Mysticism. Campbell Institute Bulletin, Nov. 1912. Maeterlinck's Mysticism. Campbell Institute Bulletin, April 1913. Our Aim in Christian Union. Christian-Evangelist, 53:232. Feb. 24, 1916. What Difference Does Religion Make? Scroll, April 1926. The Need of Religion Today. Christian (Scroll), April 22, 1926. Christian Union. Christian (Scroll), June 17, 1926. Omitting the Third Verse. Christian (Scroll), June 24, 1926. Character Through a Cause. Christian (Scroll), July 1, 1926. In the Land of Jesus. Christian (Scroll), Nov. 4, 1926; Jan. 6, 1927. One Day in Athens. Christian (Scroll), June 2, 1927. The Disciples of Christ. Christian (Scroll), June 9, 16, 23, 30, 1927. A Confession of Faith. Christian (Scroll), March 8, 15, 22, 29; April 5, 19, 26; May 10, 27, 24, 31; June 14, 21, 1928. An Open Letter to Eloise. Christian (Scroll), Nov. 22, 1928. An Open Letter to Charles. Christian (Scroll), Nov. 29, 1928. An Open Letter to Mr. Stevens. Christian (Scroll), Dec. 6, 1928. An Open Letter to a Friend. Christian (Scroll), Dec. 13, 1928. The Nature and Extent of Utility. Christian Union Quarterly, 18:324-36. April 1929. Liberals Among the Disciples. Christian (Scroll), Sept. 5, 1929. An Open Letter to Professor Kershner. Christian (Scroll), Nov. 7, 1929. Humanism. Christian (Scroll), Nov. 21, 1929. Haydon's Humanism. Christian (Scroll), Jan. 30, 1930. Disciples Divinity House Chapel Dedicated. Christian (Scroll), Nov. 13, 1930. Tasks for Churches. Christian (Scroll), Jan. 11, 1931. Intellectualism's Challenge to Christianity. Christian (Scroll), June 13, 1931. Walt Whitman's Religion. Christian (Scroll), June 20, 1931. In Defense of Churches. Christian (Scroll), Dec. 26, 1931. A Philosopher Appraises the Disciples. Christian (Scroll), July 16, 23, 1932. What Are the Disciples to Do? Christian (Scroll), Oct. 1, 1932. A Program for the Disciples. Christian (Scroll), Oct. 15, 1932. Church Finance. Christian (Scroll), Jan. 14, 1933. Religion and Democracy. Christian, Feb. 18, 1933. Religion and Science. Christian, Feb. 25, 1933. Religion and Industry. Christian, March 4, 1933. Religion and Technocracy. Christian, March 11, 1933.
Leisure and Its Uses. Christian, March 18, 1933. A Methodist Revival Dressed Up. Christian (Scroll), March 25, 1933. The Nature of the Soul. Christian (Scroll), April 15, 1933. The Easter Secret. Christian (Scroll), April 22, 1933. Preaching on Preachers. Christian (Scroll), March 10, 1934. The Revival of Theology. Scroll, March 1935. The Study of John Locke. Scroll, June 1935. The Disciples, Their Present Needs. Christian-Evangelist, Jan. 9, 1936. The Disciples' Advocacy of Christian Union. Scroll, Feb. 1936. The Disciples' Advocacy of Union. Christian-Evangelist, March 15, 1936. Living Religiously. Scroll, Sept. 1936. When We Pray. Christian-Evangelist, April 8, 1937. Peculiarities of the Disciples. Scroll, June 1937. An Ordination Charge to a Minister. Christian-Evangelist, Aug. 19, 1937. Social Action and Theory. Scroll, Nov. 1937. After Open Membership, What? Scroll, Dec. 1937. Disciples, Baptism and Union. Christian-Evangelist, May 26, 1938. The Lockean Influence on Campbell. Christian-Evangelist, Sept. 8, 1938. Surveying the Disciples. Scroll, beginning Sept. 1938 into 1939. The Disciples and Higher Education: Address for the Board of Higher Education at the International Convention, Denver, Colo., 1938. Scroll, Nov. 1938.
International Convention, Denver, Colo., 1938. Scroll, Nov. 1938. Whither Disciples? Scroll, Sept. 1939. Significance of Science. Scroll, June 1940. The New Chapel. Nov. 1929. A Real History of the Disciples: Review of Religion Follows the Frontier, by W. E. Garrison. March 1932. The Religious Control of Emotion: Review of a Thesis by Wayne Leys, May 1932. Some Practical Problems. Aug. 1932. The Disciples and Preaching. July 1933. Modern Preachers: Review of American Preachers, by E. D. Jones. Feb. 1934. The Need of the Hour. May 1934. The Minister's Dynamic. Nov. 1934. The Ideals of the Disciples. Aug. 1935. Training Men to Preach. Nov. 1935. The Disciple Inheritance. Feb. 1936. Personal Appreciation of Professor W. D. MacClintock. May 1936. Reasonableness in Religion. Aug. 1936. The Minister's Mornings. Nov. 1936. The Religious Uses of Science. Feb. 1937. Historical Studies of the Disciples. Nov. 1937. Science and Religion . (A WGN broadcast.) Aug. 1938. Disciple Sense of Cause. Feb. 1939. Keeping the Mind Alive. May 1939. The Conception of God. Nov. 1905. Aggressiveness in Religion. Dec. 1905. The Free Gospel. Feb. 1906. The Perplexities of Faith. April 1906. The Rise of Religion in the Individual. May 1906. Centennial of the Disciples. Sept. 1906. Christian Union and the Disciples. Jan. 1907. Renouncing the World. Feb. 1907. The Disciples and Their Ideals. March 1907. The Divinity of Christ. May 1907. The Religious Nature of Man. June 1907. The Investment of Truth. Aug. 1907. Why I Am Not a Unitarian. Nov. 1909. The Empirical View of Jesus. Dec. 1909. Twenty Years a Minister. Jan. 1910. Education and Initiative. April 1910. Christian Union in the Local Congregation. June 1910. The Passing of Religious Controversy. Jan. 1911. Two or Three Together. Feb. 1911. A Letter to the Church. April 1917. The Meaning of Worship. Feb. 1918. The Mission of Disciples. 1902. 15 pp. A Personal Confession of Faith. 1902. 15 pp. Christian Union and the Disciples. 1903. 15 pp. The Friendship of Jesus. 1904. Practicing Christian Union. 1915. 19 pp. The Difference Between Churches. An Anniversary Sermon, Oct. 7, 1917. 15 pp. Open Letters on Religion and Democracy, Science, Industry, Technocracy, and Leisure. N.d. (1933). 56 pp. The Disciples and Higher Education. Address delivered at the International Convention of Disciples of Christ, Denver, Colo., Oct. 18, 1938. 13 pp. Whither Disciples? 1939. 29 pp. The Isolation of the Christian Religion. N.d. Religion as Enrichment of Life: Purposeful Living; Cooperative Living; Mystical Wholeness; Ceremonial Celebration. N.d. 16 pp. Orders for the Communion Service. N.d. 27 pp. The Reincarnation of Christ: A Sermon. N.d. 16 pp. A Pragmatist's Philosophy of Religion. Lectures at the Pastors' Institute, University of Chicago, 1936. Contents: I. The Meaning of Pragmatism. II. The Pragmatic View of Religion. III. The Pragmatic Conception of God. IV. Further Implications of Pragmatism. The Reasonableness of Christianity. Lectures at the Pastors' Institute, University of Chicago, 1937. Contents: I. The Meaning of Reasonableness. II. Christianity and Reasonableness. III. Rationalist and Empiricist Views of Reasonableness. IV. Some Implications. When Science Comes to Religion. Lectures at the Pastors' Institute, University of Chicago, 1938. Contents: I. Historical. II. Fruits of Science and Their Religious Use. III. Unity and Scope of Science. IV. Science and Religious Values. Religious Implications of John Dewey's Philosophy. Lectures at the Pastors' Institute, University of Chicago, 1939. Contents: I. His Philosophy and Problems of Religion Today. II. A Common Faith. III. Scientific Method, Religious Attitudes and Values. IV. Views of Nature, Man, God, and Ideologies vs. Theologies. This Human Life. Gates Memorial Lectures, Grinnell College, 1937. Contents: I. Hunger and Hope. II. Ways and Means. III. Anxiety and Elation. IV. The Thick Web of Life. Imagery and Meaning in Religious Ideas. Alumni Lecture at Yale Divinity School, 1932. The Will to Believe. Lecture at Northwestern University, Oct. 1937. Current Philosophies of Religion. Mimeographed notes on four lectures. John Locke. Lecture at the Art Institute, Chicago, 1928. Man Looks at Himself. Commencement Address, Lynchburg College, 1935. The Philosophical Background of the Disciples. Paper before the Commission for the Restudy of the Disciples, 1936. What Is Religion? Sermon in the Chapel of the University of Chicago. The Religious Response. Sermon in the Chapel of the University of Chicago, July 23, 1934. Training for Wisdom. Commencement Address, Transylvania University of the College of the Bible, Lexington, Ky., 1940.